Its shape and size alone make it a very attractive pellet (+/- 13mm) for any sucker mouth fish. Made with the best ingredients available, this scientifically formulated diet fulfills the dietary requirements of any herbivorous fish. 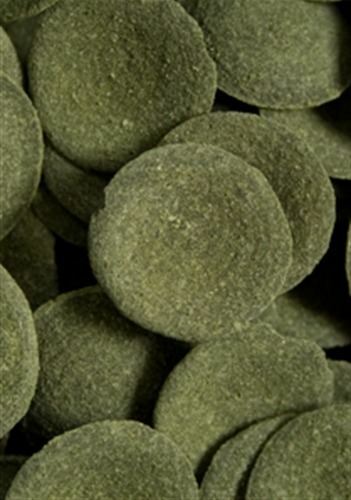 This Spirulina boosted pellet will not leach in the aquarium. Feed only as much as your fish can consume within two hours. Provide all the dietary requirements your fish deserve. Made from the finest ingredients available. Fish fillets, algae, wheat flour, wheat gluten, alfalfa, spirulina, soya, krill (Euphasia pacifica plankton), refined fish oils, yeast (ß-glucans), lecithin, vitamins (retinol (vitamin A), cholecalciferol (Vitamin D3), tocopherol acetate (Vitamin E), L-ascorbic acid Phosphate (Vitamin C), menadione (Vitamin K3), thiamine mononitrate (Vitamin B1), riboflavin (Vitamin B2), pyridoxine (Vitamin B6), cobalamin (Vitamin B12), biotin (Vitamin H), pantothenic acid (Vitamin B5), folic acid (Vitamin B11), niacin (Vitamin B3)), minerals, antioxidants, carotenoid pigments. The wafers contain stabilized vitamin C and other immune boosters. What fish can I feed wafers to? How much food do I need to give my fish? How often should I feed my fish? Our Algae wafers are specially formulated for herbivorous species such as Ancistrus type of fish. Our Tropical wafers target omnivorous fish such as loaches and catfish. 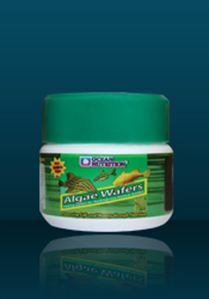 Shrimp wafers are a direct result of the increase in popularity of freshwater shrimps in nano- and planted aquarium. The diet of bottom dwelling fish has often been neglected because of the misconception that these ‘cleaners’ eat the leftovers of the feed not picked up by the top dwelling fish. This often results in irreversible damage caused by malnourishment in common species of Corydoras and loaches. Once again, fish are opportunistic feeders. However, it isn’t because the fish rise to the surface of the tank each time one walks buy that one needs to feed them. The importance lies in the quality rather than the quantity. Contrary to popular belief, fish don’t need to eat as much as we think and there are several reasons for this. First and foremost fish unlike us don’t need to spend much energy in fighting gravity as they evolve in a three dimensional environment. Second reason is that fish are cold blooded animals and don’t spend any energy unlike us to keep warm. Third reason is that humans spend lots of energy in producing urine fish just produce ammonia. But last and not least, our fish evolve in an artificial environment however large the tank may well be. This is of course the million dollar question. Fish are by nature opportunistic feeders. Meaning that they will feed on whatever they can find. There is no clear cut answer here. A general guideline for feeding flakes and pellets is feed as much as your fish will eat in 2-3 minutes. The key is to feed little but often. This is not only very important for the digestion of fish but also allows the filter to cope easily with any uneaten or undigested food. 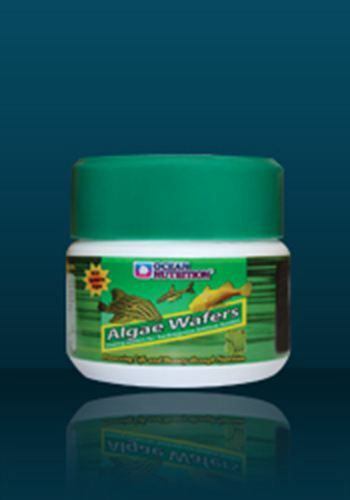 Wafers on the other hand take longer to be consumed and algae can be grazed upon all day. 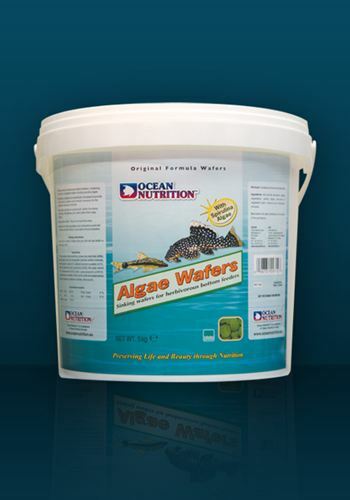 Wafers are disc shaped pellets designed to specifically meet the needs of bottom dwelling fish species. They reduce competition with top dwelling fish species at feeding time because they sink quickly to the bottom and are too hard to eat by top dwelling fish. Made from the best ingredients available, the wafers will appeal even to small nibbling species. Unlike flakes, it can take a while before wafers are totally consumed by bottom dwelling fish, which is why they are specially formulated not to cloud the water.